The RCS has been busy filming and editing group videos recently. On Mayan Doosmday 2012, we went downtown in VOCALOiD cosplay to go and film our Christmas video, White Christmas. Consider this video out holiday gift to you. Additionally, a few months ago, Anya, Shimada and Erik went to film a VOCALOiD breakup video to Taylor Swift’s We Are Never Getting Back Together. Post production proved to be a major difficulty for Shimada, but she was finally able to finish up the video and post it in time for Christmas! Thank you for reading and from the RCS to our readers, we sincerely hope your holiday season is going well. New Members + RCS Now Officially On deviantART! 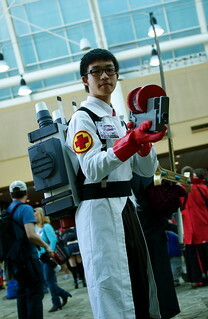 SomebodyKuma (Erik) as Medic from TF2. Shimada Yoko (Shimada) as Fall version Hatsune Miku. First, we are proud to announce that two more members have agreed to join our group! SomebodyKuma and Shimada Yoko have been doing projects and hanging with most of our members for a long time, so them being official members rather than “friends of the group” was frequently a desire of ours. After being invited, they happily agreed, and thus, we are now seven members strong! Now that our membership has become a little stronger, we are hoping that this year will be a year of many projects for the RCS, including cosplay music videos, more group cosplays, and more frequent updates for the podcast. Support our new members, follow them on their accounts across the internet! Lastly, all of us here at the Canadian division of the RCS send our best wishes to our member Erin (Erin-Aru), who is currently busy serving in the US Navy. We miss you, Erin and are proud of all you’ve accomplished and made it through! School has started, but we can still say that we’ve recently gotten to have some convention fun! Our summer convention, Cos & Effect 2012, which took place during the last week of August was a lot of fun! Anya made a fan video to document the fun that we had, so if you’d like to see what some of the RCS members (Anya, Chelsea and Lio) have been up to, go check it out! Also, we send our best wishes to RCS member Erin, who is currently serving in the US Navy. We love you Erin! This year has proved to be a busy one – busier than I ever would have expected. Between school, extracurricular activities and con-going, it seems that very little time was found to be put into the podcast and blog updates I intended on doing regularly. Essentially what I am getting at is that this blog has not been abandoned; summer is here, which means that I now have more time to get to the podcast post-production I’ve needed to do for the past few months, but also, that I now have the time to keep this blog up to date with the cosplay projects that our members are up to (mainly Fantasyrhia and I, since communication hasn’t been terribly regular between our other group mates). The podcast though, will unfortunately have to spend a tad more time on hiatus, as my computer’s backup has recently, under unknown circumstances, been corrupted. This backup system houses all of my cosplay photos, photography and audio files. Therefore, until the files can be salvaged, I will be unable to edit new episodes of the podcast. I can say that, fortunately, the most recent episode has been fully edited and just needs to be posted, therefore once everything is back in order, we’ll be set to release the next episode right away. Thank you to all who keep up with this blog and please stay tuned for our soon-to-be updates! Also, if you would like to see more frequent updates from our individual members, please stop by their respective web pages; these can be found on our ‘About Us’ page. We’re back! We’ve had an unexpected hiatus over the last little bit, but now we’re back full force with cosplay updates and a brand new episode of the podcast! With Tsukino-Con 2012 over, we’ve all been left with quite a few new cosplays! For more, be sure to visit our deviantART accounts! As for the podcast, Erin (Erin-Aru) spent a few days around New Year’s with us, and during that time recorded an episode of the podcast with Chelsea and I! Despite it going through post production to come out past New Year’s, we’re still calling it our New Year’s show. This new episode of the podcast is centered around the topic of Cosplay For Beginners. We tackle everything from choosing your character based on your experience, to how you can go about putting your cosplays together. This episode’s featured cosplayer is our local superstar, Twinfools! During Storytime, we’ll be sharing our embarrassing tales back from our beginner days. Plus, a bonus derp reel at the end (this episode was recorded late on New Year’s Eve, so there’ll be plenty of half-awake laughs to go around)! You won’t want to miss it! please be sure to rate and comment! Want to know when the newest episode is out? Subscribe! Have a question relating to cosplay? Send us your questions either by commenting on the blog, or noting/commenting us on our deviantART accounts! (http://anyapanda.deviantart.com or http://fantasyrhia.deviantart.com) All questions will be addressed during question and answer podcast specials, or privately over the internet! Episode 2 of the Royal Cosplay Society Podcast Now Out! 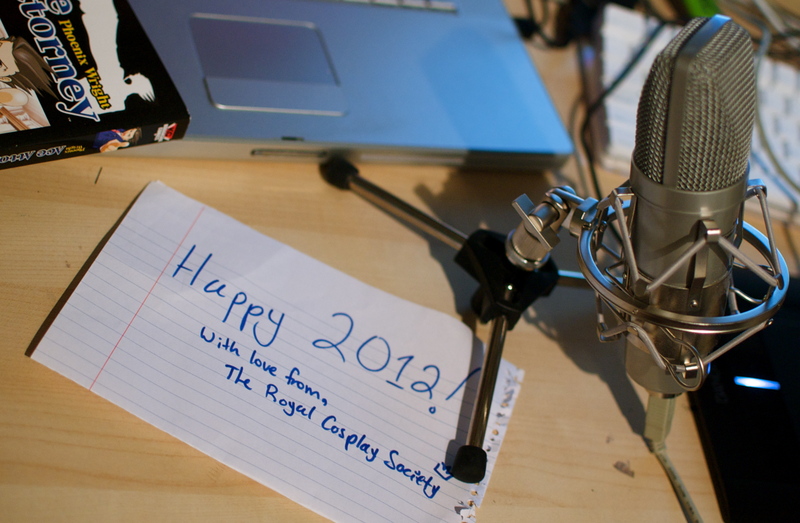 Episode 2 of the Royal Cosplay Society Podcast is now available! This episode will be focusing on the subject of “Con-Going 101.” We cover everything from what to bring (and not bring), to our “Con-Going Survival Guide.” In our Cosplayer Spotlight, we’ll be featuring Hee-Hee [http://xhee-heex.deviantart.com], (the twin of Hopie [http://hopie-chan.deviantart.com], who we featured last episode). And later, in our Story Time segment, we’ll be sharing some of our craziest (and creepiest) con-going stories! So please, don’t miss it! Also, we are still looking for questions for the Q&A spin-off show we plan to do, so please, if you have any questions about the topic of “Con-Going 101,” or anything relating to our “Introductions” episode, please leave us a comment! Thanks! Like our podcast? Then please be sure to follow us by clicking the “+Follow” button at the bottom of the page! We always appreciate support! Thank you and have a happy January! Recently, over New Year’s week, we were lucky enough to have Erin (Erin-Aru), the American division of the group, come and visit for a few days! As you can imagine, we got up to all sorts of cosplay-related shenanigans and are now going to share the results of such shenanigans for your enjoyment. While we’ll be showing a few of the photos that we got over the weekend here in this post, please be sure to check out Erin’s deviantART as well as Anya’s deviantART and Flickr for the full round-up! On the first day of Erin’s visit, we got right down to business to defeat, the huuuuuns by having an indoor photoshoot in my room’s “in-home studio” of Erin’s China (Hetalia: Axis Powers) cosplay. Her first time wearing China, she used her real hair, but it has since become shorter (and she’s also seeking more cosplay accuracy) so we hooked her up with my Rukia wig (AKA black wig of everything) and Touko extensions. I also did her makeup, since she didn’t wear makeup the first time. She then grabbed a panda from my extensive collection and off we went! It was about 10PM when we started and sometime around 11PM when we finished. Late night shoots for the win! 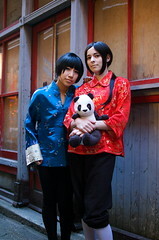 For the second day, we met up with ShimadaYoko (http://misostudios.deviantart.com), a friend of the group’s, for a ChinaxJapan shoot in Chinatown. After making the necessary improvements to Erin’s hair and makeup, I threw on my Ramona Flowers cosplay and we caught a bus downtown; we were sure to choose a pair of seats in the front so that we could act as a rather colourful greeting to everyone who boarded – oh bystanders, how we love to freak you out. that “it’s your pride that will keep you warm.” What wise words from a fellow a fellow cold weather trooper. Although, even though, as cosplayers, we have so much pride, in this situation, I think nature still had us beat. strict rule-abider by nature, so I was really uneasy, but my photo subjects talked me into taking their photo back there for a little while. Then I voted that we scram out of there; we were never caught taking photos at any point. Phew! shots – it had good light, though and was a suitable setting! Shi knows what she’s doing! Despite not getting a lot of shutter time, I still got some good shots of my cosplay. And so, after the mall, our super cold pre-New Year’s Eve photoshoot drew to a close. Overall, we got some really good shots! It was also nice to see Shimada and Erin grow so close only after knowing each other for such a short period of time. They worked very well together and were a pleasure to work with! Once we were all good to hang out together, we went and recorded a new episode of the podcast. Handling three people in the studio was a little tricky – plenty of audio derps to go around, but we were eventually able to get down to it. So, even though it’ll be pretty late once it goes through post-production and gets released, you can still look forward to a “New Year’s” episode of the RCS podcast, featuring our first ever special guest! We all truly hope that you all had a wonderful New Year’s and wish you the very best for 2012! Erika with Yozakura Quartet vol. 1 - the manga that's featured in her first scene of episode 1 of DRRR!! Skipping to day 5, this was the day before Erin had to leave (and the day before I had to get back to school, yuck)! So, since we hadn’t gotten the chance to have one outdoors, we had yet another indoor photoshoot for Erin, only this time, she sported the Erika Karisawa (Durarara!!) cosplay that she brought with her. Again, she borrowed my wig, I styled it, did her makeup and we had a sweet little shoot! …Was Erin’s last day visiting, not much more to say. So there’s a little rundown of what’s been going on with the group! Hope you enjoyed reading! We’re looking to provide some additional behind-the-scenes footage for future projects (like photoshoots), but if there’s anything else that you’d like to see on the blog, please let us know! We’re always looking for feedback, whether it be on our general posts or the podcast, so please don’t be shy! Like our blog? Then please don’t forget to follow us by clicking the “+Follow” button below! Thanks all~!